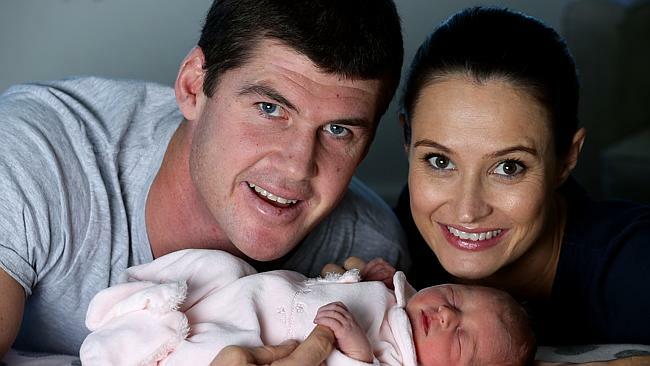 Retired AFL star Jonathan Brown, formerly captain of the Brisbane Lions, and his wife Kylie, welcomed their daughter on June 25 and have named her Macy Rose. Macy Brown was born early in the morning at John Flynn Private Hospital on the Gold Coast, weighing 2.9 kg (6lb 7oz) and 48 cm long. She joins big sister Olivia, aged 4, and big brother Jack, aged 1; Jack’s birth was announced on the blog. Jonathan announced his retirement due to injuries the night before Macy was born. Thank you to Nicole for sending in this celebrity baby tip! All celebrity baby news is gratefully received.